The veteran activist has joined hands with the Rashtriya Kisan Mahasangh to demand Lokpal, MSP and freedom from debt for farmers. 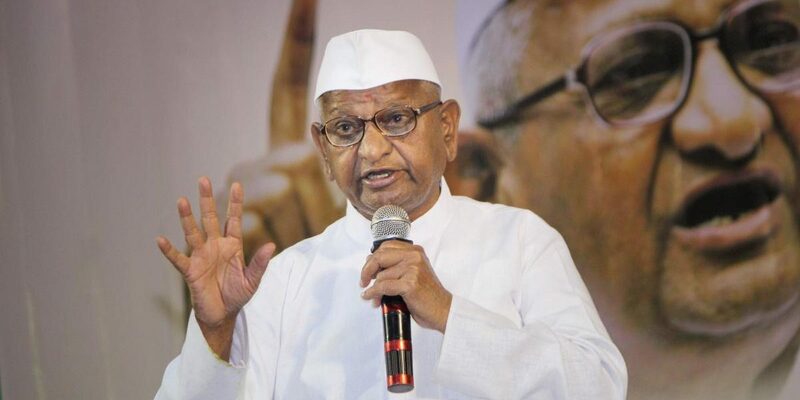 New Delhi: Veteran anti-corruption activist Anna Hazare will begin an indefinite hunger strike on January 30 in Maharashtra’s Ralegan Siddhi village over his long-standing demand for the appointment of Lokpal. This time, he is also demanding that the government take steps to resolve the farmers’ distress in the country. Hazare has joined hands with the Rashtriya Kisan Mahasangh (RKM) – a coalition of 180 farmer organisations across India. The RKM is led by Shiv Kumar Sharma, also known as Kakkaji, who was one of the main leaders of the 2017 Mandsaur agitation that propelled farmer distress to national headlines. “Before the 2014 Lok Sabha election, Modiji promised to implement Lokpal/Lokayukta Law and the Swaminathan Commission report on farmers. The present government is about to complete five years but till now, neither the Lokpal or the Lokayukta has been appointed nor the report of the Swaminathan Commission implemented. The people of the country believed in the promises of Modi and voted him in 2014, but now even after five years, even after all these promises are not fulfilled, the people of the country are feeling cheated,” Hazare said at a press conference in Delhi. Appointment of Lokpal in the Centre and Lokayukta in all states. Minimum support price (MSP) for crops should be set at cost (C2) plus 50% as recommended by the Swaminathan Commission on farmers. Ensure that farmers are completely free from debt. Fix MSP of fruit, vegetable and milk. Hazare will begin his fast in his village Ralegan Siddhi on January 30. Simultaneously, leaders of the RKM will be on fast at 12 different places in the country. Hazare and RKM have also announced that no political parties will be allowed to join the protest.